A patio is a delightful addition to any home. Whether you’re interested in installing an outdoor kitchen or a simple seating area for your guests, you’ll find that a well-constructed patio can boost your property value and your overall opinion of your home. When it comes to building materials, you have a lot of options to choose from; however, it’s hard to deny the benefits of concrete. Here are just a few of the benefits that a concrete contractor in San Antonio can provide for your patio project. Wood decks were very popular for a long time; however, more and more decks are needing to be replaced after years of warping, rotting, and wear and tear. Concrete, on the other hand, is as durable as they come. If installed correctly, your concreate patio should stand up to decades of foot traffic, rain, hail, yard debris, and anything else that may come along. Your concrete patio won’t even crack as long as your contractor reinforces it with rebar. Natural stone is often an elegant choice for patios, but what you see is what you get. Unlike natural stone, concrete can be molded into whatever shape, color, or texture you desire, allowing you to achieve precisely the aesthetic you’re looking for. Do you want a patio shaped like the State of Texas? Concrete can get it done. You’d be amazed to see what an experienced concrete contractor can put together. A patio should be enjoyed, not toiled over. Once your concrete patio is installed, you’ll find that it’s exceedingly easy to maintain. Since it’s a solid surface, you won’t have to worry about annoying pieces of debris falling between the cracks. 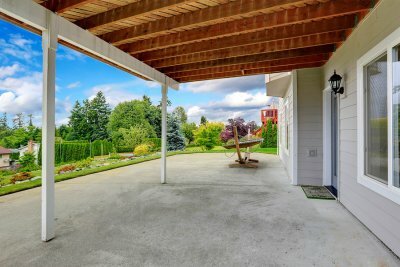 There’s no need to seal or stain your concrete patio—all you have to do to keep it clean is give it a good sweep every once in a while. You might also power wash it once every few years to really make it shine.